Puppies are always hungry – and with good reason. They are growing at a fantastic rate (some breeds increase their weight by as much as ten times during the first ten months of life), and they are developing bone structure, muscle, and fat that will quite literally shape their future. 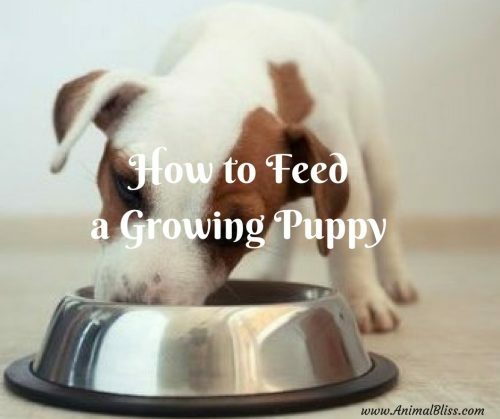 Knowing how to feed a growing pup is essential to their health. Puppies are also notoriously adept at getting their own way. If you respond to every cute trick with a snack reward, you can easily spoil your pup into an ease of malnutrition. Set up a reasonable feeding schedule early and stick to it. You’ll have a healthier dog and a happier household. A growing puppy requires two to three times as much food per pound of body weight as an adult dog. His small stomach can’t handle large servings (puppy doesn’t know this; that’s why he’s inclined to upchuck), so you have to feed him frequently. Under 3 months of age, he should have four small meals every day – morning, noon, late afternoon and bedtime. At around 3 months, you can drop the late feeding, but keep him on three meals until he is at least 6 months old. From 6 months to a year, give him two meals, morning and evening. 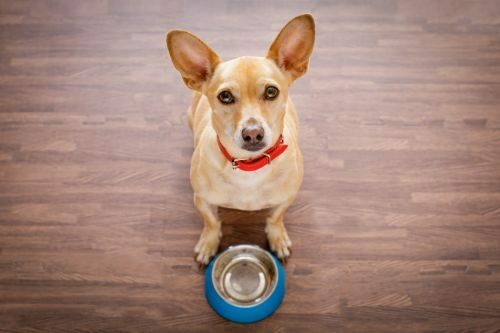 By one year of age, most dogs are satisfied with a single daily feeding. You will gradually increase the size of his servings, of course. There are bound to be individual variations in this feeding schedule. Dogs reach maturity at somewhere between 10 and 12 months. Some thrive on one meal a day as early as 10 months; others do better with twice-daily feedings all their lives. 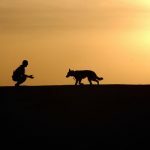 The amount of exercise your pet gets, the climate, whether he lives indoors or out, his own temperament and many other variables can affect his appetite. As a rule, a puppy should be offered as much food as he will eat, unless he’s a compulsive overeater or starts developing an unhealthy fat around the midriff. But most dogs are pretty well self-pacers on food intake, and puppies do need lots of good food to meet their enormous growth and energy requirements. What is the best food for a puppy? The all-important element in his diet is a balance. Dogs have specific food requirements; they need 43 separate nutrients to achieve a balanced diet. Nutrients are classified as a macro or micronutrients (or in layman’s language, major or minor nutrients). Protein, fats, carbohydrates, fiber, water, calcium and phosphorus are micronutrients. Vitamins and minerals are micronutrients. All are equally important. A growing puppy must have all the required nutrients in his diet; if one is missing, a nutritional deficiency will develop. That is why the foods that he eats are so crucial during a puppy’s first year of life. This is the formative period: his nervous system, bone structure, musculature and body condition are developing. An inadequate diet can upset this development and not only retard growth but also result in serious skeletal deformities. Balance is the keyword. We know, for instance, that a puppy needs some fat in his diet. Too little fat can lead to dry, scaly skin and a dull, coarse coat; too much will lead to obesity and all its attendant health problems. He needs carbohydrates for bulk and energy, but only in proportion. He must have protein, but that doesn’t mean you should put him on a diet of sirloin steak. Meat alone, unless it is fortified with other essential nutrients, would be deficient. It is so lacking in calcium, for example, that a 20-pound dog would have to eat 44 pounds of raw meat daily to get his required amount of the principal nutrients. It all sounds very complicated and, in fact, it is. You’d have to be a chemist, nutritionist, and a full-time cook to turn out the kind of balanced diet that a puppy needs. Fortunately, all this hard work has been done for you. Nowhere is the increase in convenience foods more dramatic than in pet foods. The millions of research hours and dollars that have been devoted to the study of canine nutrition by major manufacturers have resulted in excellent prepared foods, scientifically balanced to provide all of a dog’s nutritional needs. And for puppies, there are special foods that contain the extra vitamins and minerals he needs during the fast-growing months. You’d do best to stick with the foods prepared by the experts. Don’t take the risky route of trying to guess about your pet’s diet. If you choose a commercial food of high-quality, you can be sure the puppy is getting all the nutrients he needs. Current Puppy Food is the result of years of scientific study of canine nutrition at Research Kennels. Carefully formulated to support growth and good health in puppies, it contains all the vitamins and minerals that are vital during the first year. Dry puppy foods should contain 30 percent protein, more than the minimum requirement for growing pups. All you have to do is to add warm water, milk or broth to bring out the aroma and flavor and to give it the right consistency. Mix the formula at a ratio of 1 cup of liquid to 2 cups of puppy food. The chart below gives recommended amounts of daily food intake, based on the dog’s weight. Since the amounts given are for dry food, the bulk will increase somewhat with the addition of liquid. And remember that these recommended quantities are for daily servings, to be divided into two, three or four meals, depending on the age of the dog. Specially formulated puppy food is by far the best basic diet for your pet during his first year. From that age, you can start introducing other foods to accustom him to the diet that will be his adult fare. Here are some guides to selecting prepared foods. Dog foods fall into three general types. Learn to read the labels. You will find some foods described as “complete for both growth and maintenance are not idle boasts”. Such claims are carefully regulated by state and federal agencies and mean that these foods meet nutritive requirements for a balanced diet. Some pet foods (such as some canned meats, chicken, and fish) are meant only as supplements to add taste variety to the basic diet. The third kind of pet fare is the enormous selection of dog cookies, candies, and other treats. Supplements and snacks are fine for occasional treats, but not for a regular diet. 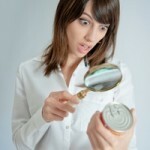 Choose the foods labeled “complete” or “balanced.” These come in both canned and dry forms. A few broken up chunks of canned puppy food added to dry puppy food is a good way to introduce new tastes. Then gradually start giving your pet an occasional full meal of canned food. This will be a special treat, because dogs love the rich, meaty texture of canned puppy food, and he’ll soon let you know which of its flavors his favorites are. 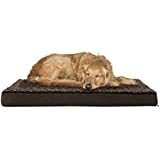 Give your puppy occasional meals of each of these also, because at around one year of age one or several of these balanced foods will come his regular bill of fare. 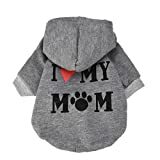 But make all food changes slowly (sudden changes can be upsetting), and be sure he has at least one meal of fortified puppy food every day during his first year. Don’t forget water! A dog’s total body weight consists of 70 percent liquid, so water is absolutely essential to his health and comfort. Serve him fresh, cool water along with his meals, and make it available to him, both indoors and outdoors, and at all times. 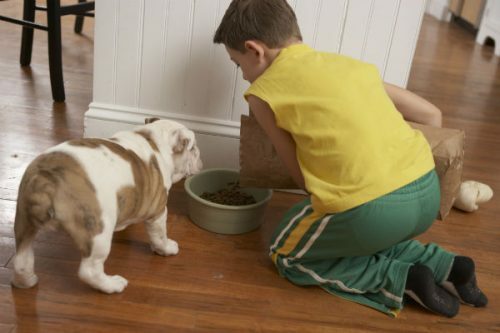 Choose a quiet place for puppy’s food and water bowls, and feed him there at regular times. Dogs like routine. Don’t talk to him, tease or distract him in any way while he’s eating. Give him 15 to 20 minutes to finish his meal, and then remove the dish. If there is food left, reduce his rations at next mealtime. 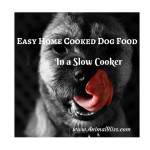 If he bolts his foods (most dogs are bolters) and noses around for more, try slightly larger servings. 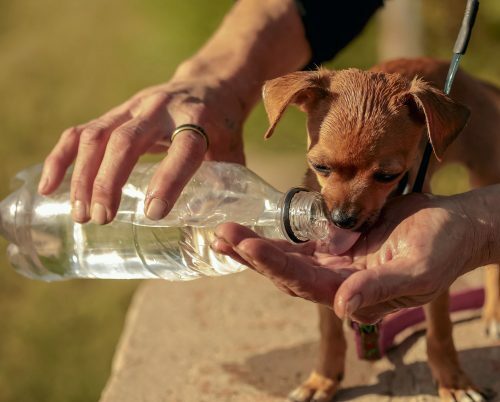 Don’t feed him when he’s excited or exhausted from play; give him a little water and let him rest before eating. Give him time to digest after meals, too-no playtime, car rides or excitement for at least an hour. Don’t feed him between-meal treats. The only exceptions to this rule are rewards at the end of training sessions or for exceptionally good behavior. Nothing can lead to finicky food habits, overweight, and even malnutrition as quickly as constant snacking in between regular meals. Never offer him food from your own table. There are no exceptions to this rule. The puppy has a right to eat his dinner in peace and quiet, and so do you. Variety in diet is not important for a puppy. In fact, you should use restraint in adding special treats, because you can easily upset the balance that is so important to his continued growth, vitality and good health. Serve them only at mealtime, or puppy will get finicky-and fat. Never let them amount to more than 20 percent of his daily food intake, or you’ll upset his nutritional balance. If you have a cat, don’t let your dog eat her food, because the caloric density, high protein levels, and heavy doses of fat can make your dog sick both mentally and physically. 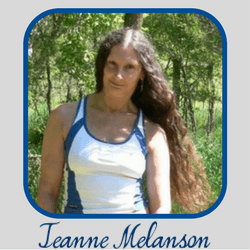 Be highly selective in tidbits and table scraps, or you’ll have a sick pup. What foods are suitable for a puppy? 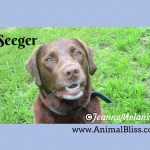 All breeds of dogs have exactly the same nutritional needs. A Chihuahua needs protein, fats, carbohydrates, vitamins, and minerals in balanced proportion just as a Great Dane does. Obviously, the quantity required varies greatly. Consider this list of do’s and don’ts in puppy feeding, but remember that dogs have different tastes, and your pet is an individualist. Your pup will soon let you know what food he likes, and what foods agree with him. Meat is rich in the protein necessary for growth and body repair. Red muscle meats can safely be served either raw or cooked; pork and fish should always be cooked. Do not cut all the fat away from meats. Puppy needs fat in his diet, and it provides a concentrated source of the calories needed during the period of rapid growth. Starches and cereals are excellent sources of carbohydrates. You must cook potatoes and rice; uncooked starches are hard to digest and may cause diarrhea. Cereals also must be cooked, or a large part of them will be passed through undigested. Eggs, milk, and cheese are valuable foods that provide protein and fats. Eggs must be cooked because raw egg white interferes with the absorption of the Vitamin B and Biotin. Milk is another good source of protein, but it is not essential if the puppy is being fed a high-quality commercial food. Friskies puppy food contains non-fat dry milk in balanced quantities. Cooked chopped vegetables are high in vitamins and minerals, but also so high in water content that it takes very large quantities to be of real value. 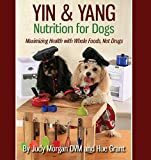 They are fine as occasional food supplements; however, if your pup has a taste for them mash them with cooked cereal and chopped meat, and be sure to add some of the water to the vegetables were cooked in. Rich gravies and sweets are as bad for a puppy as they are for you. So are highly seasoned or heavily salted foods; puppy can’t digest them and, in fact, salt is often used as an emetic for dogs. Clear those cocktail canapes away after the party. If the puppy gets a crack at them, he’s apt to have something worse than a hangover. Hot or cold foods can turn a pup’s appetite off completely. Serve his Friskies puppy food at about room temperature. That’s the way he likes it, and warm liquid will bring out the flavor and aroma. Bones are taboo. Large shank or knucklebones are exceptions, of course, but even these have more value as teething tools and playthings than as food. 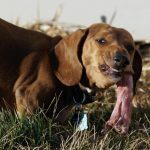 Ground up bones, as used in commercial foods, are good for him, but those poultry, chop and steak bones from your table can do serious damage to puppy’s stomach and intestine. 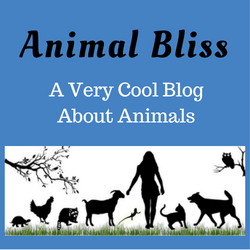 Early in this article, you were told that a puppy should have all the food he will eat. However, too much food and too little exercise are a lethal combination of man and dog alike. It is true that puppies can eat a great deal during this period of rapid growth, but don’t let him eat to the point of getting bloated. If you see a bulging midriff developing, cut down on his rations. Obesity is a common and serious health problem, especially in older dogs, so you should start being your pup’s weight watcher while he’s young. 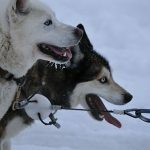 Guest Author: Imad LB is the founder of Howpup.com, where he and his associates write about dog behavior, health issues, and tips and tricks on how to get your dog to behave! 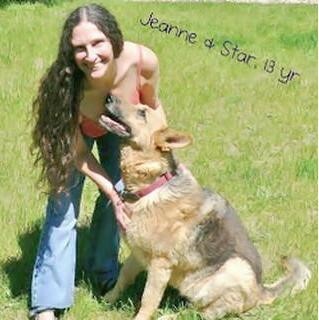 It concentrates on creating the best life for you and your dog so you can enjoy each other’s company and build that trust that is so important to pet and human. I found your article very useful. We just got a new puppy and I’m struggling on training her to eat food.